Fruit chaat is a much loved dessert in Pakistan and is especially loved during the month of Ramadan owing to how light and healthy it is. The best thing about it is how simple and flexible it is. 3-4 cups fresh juice, or just enough to cover the fruit so it doesn't go black. I used a mix of orange and pineapple juice. Mix the spices in the juice and then add the fruit. That sounds great. Normally I can't imagine adding salt and pepper to a fruit salad ... I learn something new every day. Thanks for sharing ... will try this for sure! chaat masala is basically an indian spice Gerhild, and is used to add a slight spice to the dish. if you cant find it use mango powder. it works equally well. i searched online and found a site that sells indian spices...heres the link..
but honestly, if you cant find either, just use black pepper and salt and use juice that is light like orange or pineapple juice. mango juice for e.g. will make the dish too heavy. 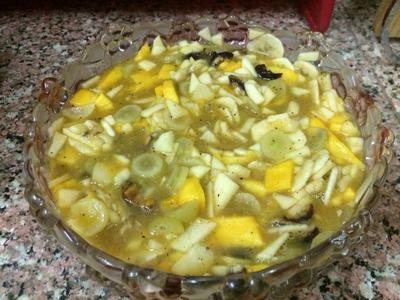 Tabeer, this looks something like a fruit salad with interesting spices. Can you describe what chaat is, please? Since I don't think it's available here in Canada or USA (since I haven't seen something like that here), can you tell us what we could use in its place? I like how you use the juices to keep the fruit from going black. I usually use lemon, but I like your idea of using pineapple juice.